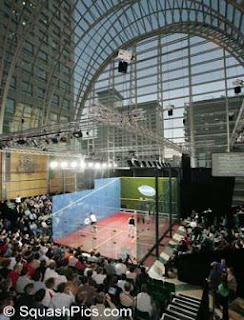 When I heard that world number one Amr Shabana and Australian Anthony Ricketts had withdrawn though injury from the Canary Wharf Classic 2007, I felt sorry for the spectators (and promoters) that they would not be treated to as strong a line-up as in previous years. How wrong I was. 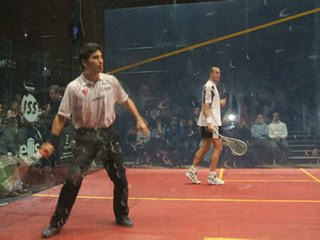 The competitive edge at the top of men's squash nowadays means that there are almost no easy games - and the first semi-final (I was there on the Thursday night) was a minor classic. But more later. Arriving at the East Wintergarden by the back door, I entered the sponsors'/bar area to a wall of noise. There's a gilt edge to this tournament that's not visible at venues elsewhere in Britain (though they have their own charms); I think it's a combination of the majesty of the venue (see right) and the fact there there is, simply, more money sloshing around: being in the heart of the city there are lots of suits in attendance. 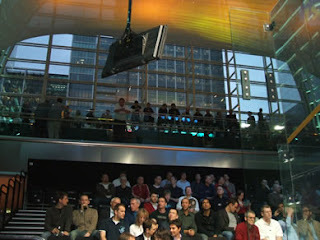 Anticipation was also palpable before I found my way to my sidewall seat, and it was great to see such a wide range of spectator, with many clearly watching professional squash for the first time. Something that I've noticed that squash doesn't do as well as other spectator sports (football is a good example) is fill the "performance space" with activity prior to the main event. This leaves the audience talking amongst themselves while staring blankly into the glass box in front of them. So it was great to see master of ceremonies Alan Thatcher orchestrating a kids' hitting-accuracy competition before Lincou and White arrived on court for the first of the semis. John White looked lean and (and mean, with crewcut for emphasis), and set out to blast Thierry Lincou off court from the first point. The Frenchman is a well-known as a slower starter, and couldn't compete with the Scot's scything cross-court kills in the first. It quickly became apparent that Lincou would have to out-think his opponent rather than match his muscular game, and this he did, neutralising White's power in the second with some clever deceptions which frequently caught the lanky former winner flat-footed. It wasn't enough though, and White persisted in bullying his way to 12-10. A new feature introduced by the officials to this year's competition was a "three referee" system, designed to minimise the number of player-official confrontations over disputed points. What was interesting was that one of the officials was a player (in the White-Lincou game it was Adrian Grant), with a majority-vote being taken via hand signals from the officials placed throughout the back-wall crowd. What looked like an elaborate game of scissors-paper-stone was actually a reliable and highly-workable form of officiating, though I don't know if this would work in a World Open or Commonwealth Games final when stakes are higher (could all player-officials be trusted to be 100% impartial?). It must be infuriating to play Lincou; he gives nothing away and is impossible to read. Browsing the programme I picked up when arriving at the East Wintergarden (noticeably well-written - the player profiles actually gave an impression of the players' characters rather than the usual list of statistics) in between games I read an article about the player from Reunion Island that revealed a keen interest in the psychological aspects of the game. He is a master at keeping his cool, though he has the fitness to match. His physical as well as mental stamina took the next game from White 11-9, and we were set for a five-game marathon. Lincou's greater concentration showed in the next game, as White got increasingly frustrated, with Lincou maintaining his poker face. Tinned drops cost White dear as Lincou brought the match to a decider. The turning point came in the final game came when White was 7-5 down. Pulling off some astonishing retrievals to keep himself alive, he forced Lincou to hit a loose drive down the middle. Putting away the kill brought the sell-out crowd to their feet, and any neutrals in the crowd by this stage would have thought that he'd done enough to deserve the win. It was still point-for-point until the end, but the momentum was White's. After winning 12-10 the crowd gave both players the longest standing ovation I've witnessed at an event in this country. 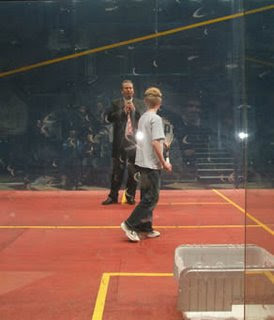 The second match between James Willstrop and Nick Matthew was never going to match the intensity of what preceded it. Matthew was obviously not at full strength after recovering from injury and illness and British champion Willstrop won in straight games. By Friday John White's string of five-game matches had clearly taken their toll, though he still had the gas to force Willstrop to fight for his second title. A patient Willstrop gradually wore the Scotsman down, and the US-based player finally wilted towards the end of (yet another) match that went the distance. It was the English number one's second win in a row over White, and it will be interesting to see if he can sustain a winning streak to claim the world number one spot that, on this evidence, he is clearly capable of.